My mother-in-law was hoping to buy a size 1 baby sweater to be delivered when Q made his way to Colorado. He left this morning at 6a. The sweater was finished last night at 12a. 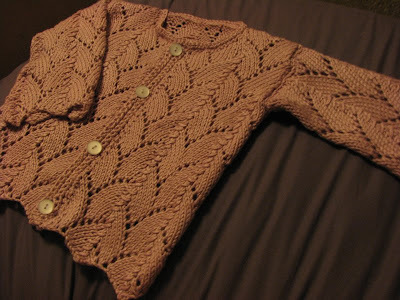 My class play is coming up this week and I've been so busy with it that I haven't had time to do much knitting lately. I was also making up the pattern as I went, which of course led to a few "frogging" (ripit, ripit) moments, especially in designing the neckline. In the end I'm happy with how it came together though. I like the lack of ribbing. The bottom edges naturally formed cute little points due to the lace pattern and the neck just got two rows of single crochet when I did the button bands. The crochet works nicely to give the floppy lace pattern a bit of a boundary. On to the specs - it's knit of Baby Bamboo (from the awesome sale I found last year), 20" chest circumference, sleeves 8" circumference. Body is 7" long from the armholes and sleeves are 7 1/2". Knit on size 6 needles using the "alternating leaf" lace pattern from the Big Book of Knit Stitch Patterns (which I love, by the way), the body has 111 stitches, sleeves 45. It's totally one of those knit in squares then assemble type patterns. The body was knit as one piece; at the armholes I cast of 2 st at each one and attached new yarn, keeping all three pieces even. 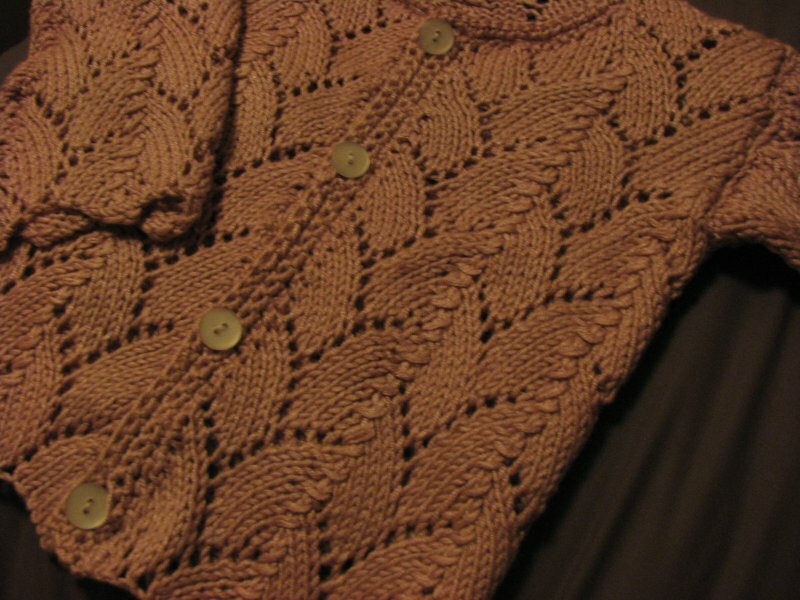 Sleeves were knit simultaneously as two rectangles. Sew shoulder seams, sew sleeve seams, set in sleeves, crochet on collar and bands. My favorite part of knitting lace is how the pieces look crazy and uneven after you cast them off and then, through the magic of blocking, they turn into these light, airy pieces of fabric, ready to be made into a garment. Anyone who doesn't believe in blocking has never knit lace. Q had a nice high fever yesterday after being sick for two days before that. Thankfully, the fever broke last night before he had to fly out this morning. I feel like I barely saw him for the last 3 days because he was always sleeping. I'm glad I didn't have to send him off super sick. Q had a pudding craving for his poor sore throat. The curse with making pudding is having egg whites that then have to be used. Dad had a craving for divinity at Christmas so I made a batch of that to use the whites. (Q took it with him to CO to deliver it.) I followed that little sweets making binge with the weekly yogurt making. For anyone who's ever made those three recipes, it will not be surprising to hear that I spent almost a solid 2 hours yesterday slowly stirring one thing or another at the stove as it heated. Thankfully, one can read and stir. The weather's gotten super nice and the bees are now working almost twelve hour days. Their pollen baskets have been so loaded that they seem to practically fall out of the air on to the landing area in front of the hive. We're going to check on the need for new frames next weekend. Speaking of bees, we also apparently still have the hive in the cherry tree. There's also always a cloud of bees up at that opening as well. Most well-pollinated neighborhood ever. Twelve asparagus plants are now putting up impossibly small shoots. On the dark side though, almost all of my early rhubarb leaves have withered and died off. I'm hoping they pulled back to conserve in that cold snap and will come back in full force if this warmer weather sticks around. Check out this article about JO Food Revolution. I thought it made some interesting points. All of your projects look fantastic! I wish you and Q luck with the bees and gardens!